Fancy color diamonds in well defined colors including red, pink, blue, green and canary yellow, are highly prized and particularly rare, but in traditional diamonds the best color is no color at all. These diamonds are graded starting at D for colorless diamonds and continuing through the alphabet to Z, for yellowish ones. 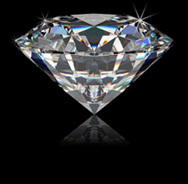 While many diamonds appear colorless, they may actually have subtle yellow -brown tones in color grades of M to P.